We are often surprised when things we’ve grown up with and become accustomed to are utterly foreign to people on the other side of the same country. To explore this idea, I took a spin through Factual’s data to look at fast food chains around the US that, depending on who you talk to, might be known as dietary staple or might not be known at all. Until my recent move to LA, I spent my entire life anchored in various cities in the Northeastern United States. When I finally moved across the country, one of the first things that struck me was the dramatic change in the fast food landscape. Checkers Burgers were replaced with Rally’s, unfamiliar chains like Jack in the Box cropped up all over, and most shockingly, Dunkin’ Donuts was nowhere to be found. In 2012 Dunkin’ Donuts had the 4th most US locations of American Fast Food Franchises1. In New York City (less than an hour from my hometown), there are over 500 Dunkin’ Donuts establishments today; that’s almost twice as many as Starbucks2. However, Dunkin’ Donuts is located almost entirely east of the Mississippi. Los Angeles has none today3. In fact, there are presently fewer in the state of California than there are within a five mile radius of every other place I have ever called home. 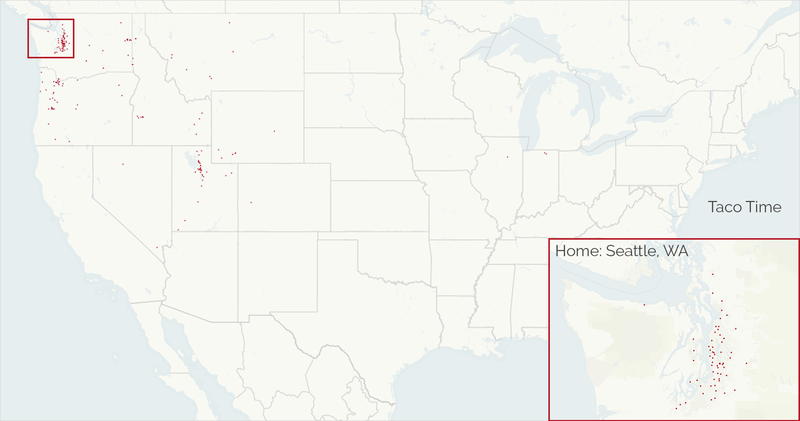 When I couldn’t find any local DD, I did what any Factualite would do: pulled the geo coordinates of every Dunkin’ Donuts in the continental US from our Global Places data and plotted them for a better look4. To paint a clearer picture of how saturated the Northeast is, I zoomed in on the area where I grew up. The surprise of seeing how East Coast-heavy Dunkin’ Donuts is got me thinking about the regionality of other fast food chains, so I started asking around. I began with a coworker who had also recently moved to LA but hailed originally from Seattle. Her surprise had come with the disappearance of Taco Time, a chain with several hundred stores predominantly in Washington and Oregon. Next, I got the perspective of an LA native. He shared with me the confusion he and his fellow Southern Californians experienced in 2004 when the movie Harold & Kumar Go to White Castle premiered. Although it is one of the oldest fast food chains in the US, White Castle exists primarily in the Midwest and has a strong presence in the New York/New Jersey area. He later remarked to me that the first time he saw one, he thought it was built as a consequence of the film. To get one last point of view, I talked to another East Coast native who moved out to California from North Carolina. He brought up Bojangles’ Famous Chicken ‘n Biscuits, a chain which is also yet to reach out West. We all experience surprises like these as we move and travel. With data, it becomes possible to step back and easily survey the country (or even the world) from new vantage points. 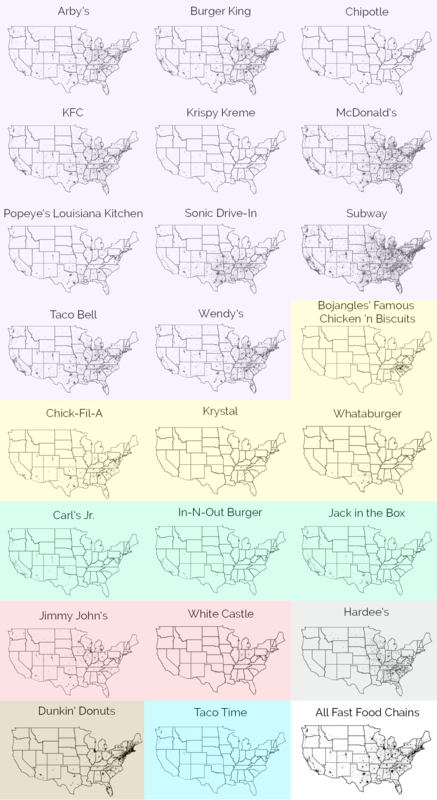 To help you see what you may be missing, I compiled maps of some of the most popular US fast food chains below and loosely categorized them by region. How many have you heard of? Eaten at? What didn’t you see coming? You can access Factual’s Global Places or Restaurants Data with your existing API key (or get one here) or request a download. Global Places has over 65 million business listings and points of interest in 50 countries. Our extended Restaurants Data has over 1.1 million restaurant listings in the US and over 200,000 in the UK.